"PMF Open Rehearsals" provide opportunities for the general public to observe musical instruction being given by outstanding international artists. You can observe the PMF Orchestra and PMF Vocal Academy's regular rehearsals. We hope that you will enjoy seeing the PMF Academy members work hard at making music in an environment with a distinctly different feel from a performance. Please come and register at the venue on the day of the Open Rehearsal. Registration will be closed after the number of participants has reached the maximum capacity. (No advance reservation or registration is needed.) Entering after the above specified registration times will not be permitted at Kitara main hall. *Music teachers of elementary, middle, and high schools, colleges and universities, as well as all U25 will be able to enter for free. Please show your ID/student ID at the reception desk and register. PMF Open Rehearsals provide opportunities to observe regular rehearsals of the PMF Academy. The rehearsal process is very different from a concert performance. 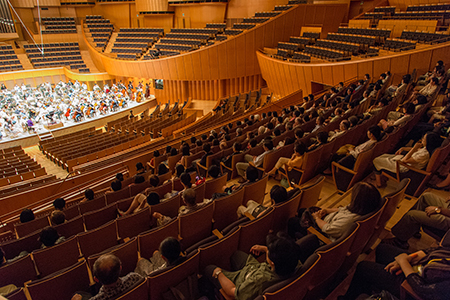 Participants may observe designated rehearsals and dress rehearsals of the PMF Orchestra. Available blocks of seats are decided in advance by the PMF Organizing Committee. There is no microphone on the stage, and some attendees may have difficulty hearing the conductors clearly. There is no interpreter available at the rehearsals. Rehearsals are subject to change / cancellation. Please check the website for up-to-date information. All photography, and audio/video recording are strictly prohibited. If this rule is violated, the recorded data must be surrendered, and the violator will be asked to leave and will not be allowed to reenter the program. Also, attendees are asked to refrain from entering/exiting during the rehearsals. Rehearsal times are subject to change. Rehearsals may be canceled, or their times changed, due to unavoidable circumstances. Unfortunately, in such cases there is no compensation. Please consider bringing a jacket or sweater in light of the air-conditioned environment and possibly cool weather.